Platelet-rich plasma (PRP) with its modifications, platelet-rich fibrin matrix (PRFM), plasma rich in growth factors (PRGF), and platelet lysate (PL) represent a new biotechnological cell-based therapy, has elicited heightened interest among patients and surgeons. This therapy is defined as an autologous preparation of plasma with concentrated activated platelets. PRP contains various growth factors (GFs) and cytokines that enhance the body’s inherent capacity to repair and regenerate. PRP has been claimed to have therapeutic effectiveness for androgenetic alopecia (AGA) in some studies.This discussion will focus on the use of PRP in hair transplantation (HT). PRFM represents a new step in the platelet gel therapeutic concept in which anticoagulants are not used and a gel is obtained instead of a solution. In the PRFM preparation process, a gel-like matrix is created, which contains high concentrations of nonactivated, functional, intact platelets present within a fibrin matrix that constantly releases GFs over a longer period. In PRFM, the fibrin matrix is well formed and it efficiently directs the stem cell migration to the site of injury. PRGF was described by Navarro et al. in which PRGF activator was added to the PRP solution and incubated for 1h. The released supernatant after fibrin clot retraction and centrifugation (1000g, 10min) was stored at -80°C. This solution was found to be rich in GFs released from platelets. PL was described by Cole et al. For preparing it, PRP collected was subjected to 30s/30s on–off sonication and maintained at 4°C. Total sonication time was set to 30min. On completion of the final cycle, the lysed platelet samples were centrifuged for 10min at 1967 × g, and the supernatant solution collected was termed as PL. PL is supposed to be rich in GFs. PRP, PRFM, PRGF, and PL have been used in HT at various stages to enhance the results. Limited literature evidence is available to document the safety and efficacy of the PRP and PRFM therapy in hair transplant surgery. The system and protocol for PRP and its efficacy is an extremely pertinent and debated topic currently, particularly on social media, and it has been a subject that is very difficult to present in an honest and fair manner to patients. The variables are many and include systems used to produce PRP, whether A-Cell is added or not, whether it is “activated” externally or not, how it should be injected, whether using a microroller is important, and what the ideal concentrations of various blood components are, quantity of PRP that has to be injected, duration, and dosage. Uebel et al., in 2006, was one of the first to report the use of PRP in connection with hair transplant surgery. Follicular units (FUs) were first immersed in PRP for 15min and then, 10 drops of 10% calcium chloride were added to this mixture of grafts in PRP solution after 15min. This converted fibrinogen into fibrin, thereby producing the plasmatic gel that would seal the GFs around the micrografts, which were then implanted. They noted a marked improvement in the yield of FUs at 7 months on the half head treated with PRP as compared to the control side without PRP. In vitro studies have indicated that PRP induces a considerable initiation and prolongation of the hair growth cycle. It also helps induce angiogenesis, which improves growth and healing. It has also been suggested that the injection therapy could be better than submersion of grafts in PRP as there is less wastage, added benefit of faster recovery of skin, activity of dormant follicles, and faster entry into the new anagen hair. Navarro et al. evaluated the effect of PRGF combined with FU extraction surgery for the treatment of hair loss in 15 patients subjected to routine FUE procedure and PRGF therapy. PRGF group included intradermal injections of GFs before implantation of the grafts over the recipient area with 30-gauge needles and follicular transfer unit (FTU) preservation in an autologous fibrin clot before implantation. The controlled group included saline preserved grafts. Postsurgical patient satisfaction and clinical improvement were evaluated, and PRGF or saline-preserved hair grafts were histomorphometrically analyzed for follicular germinal matrix and dermal papilla cells. The study concluded that PRGF is able to minimize the postsurgical follicle loss and potentiate the performance of grafted hairs. The fibrin clot not only acts as a protective barrier against environmental factors but also provides a biologically active scaffold that induces resident cell proliferation and maintains an optimal integrity of the grafted hair. Follicular cell proliferation and migration were induced after autologous GFs treatment. It was hypothesized that PRGF-preserved FTUs presented higher bioactivity signals and improved integrity of perifollicular structures and extracellular matrix proteins such as collagen and elastic fibers. PRGF not only reduced the postsurgical crust healing and hair fixation period but also decreased the inflammatory pain and itching sensation. Mahapatra et al. studied the efficacy of PRFM in hair follicular unit transplantation (FUT) in patients with androgenetic alopecia. In this study, the male subjects were treated with intradermal injections of autologous PRFM three times on one side; first at day 0 before FUT and subsequently in the 2nd and 3rd months. Control side did not have PRFM injections. An equal number of FUs was implanted in a 1×1cm2 area on both the left and right temporal area. Follicular density at a calibrated distance from the mid-pupillary point in a 1×1cm2 (right temporal area) was measured using digital photographs taken at the 1-, 2-, and 6-month follow-up visits. Hair density indices were compared using trichoscope with photographs from similar areas (left temporal area) as control on same subjects without PRFM injections. The study concluded that when compared with the control site, PRFM-treated sites retained the follicles with minimal postoperative shedding and the effect was very distinct after 6 months. Cole et al. studied the effectiveness of platelet and platelet-derived products as augmented graft therapies in hair restoration surgeries and compared the follicular regeneration rate of follicles transplanted in the presence of PL versus autologous activated PRP (AA-PRP) and saline control. AA-PRP, in the context of hair restoration surgeries, has been accomplished via thrombin, calcium chloride, or calcium gluconate solutions as a means to deliver GFs that are either secreted by the platelets or presented on the activated platelet surface. In this study, PL was delivered at a depth of 3mm into the appropriate treatment zone through a 1-mL Luer lock syringe equipped with a 25-gauge needle. AA-PRP was obtained by the addition of 10% (v/v) calcium gluconate to the PRP, and the resulting AA-PRP was immediately injected at a depth of 3mm into the appropriate treatment zone through a 1-mL Luer lock syringe equipped with a 25-gauge needle. A total of three patients were injected in three treatment zones; 4cm2 was mapped in the midline scalp region of each patient and equal number of follicular grafts were placed in each box along with PL, AA-PRP, or normal saline. In the fourth patient, the transplanted follicular grafts were placed solely with PL for comparative purpose. Hair density estimation was performed at follow-up appointments ranging from 3.5 to 7 months after surgery. In these appointments, the number of FUs with hairs measuring 50mm or more were counted to determine the percentage of graft hair regeneration. GF concentrations (vascular endothelial growth factor, transforming growth factor beta 1, platelet derived growth factor beta, and Insulin like growth factor) in PL and AA-PRP were also measured for an independent subject set. Follicular regeneration in transplanted grafts was found to be superior for those placed with PL rather than AA-PRP or saline. GF quantification showed that the highest concentrations were obtained from PL than from the AA-PRP. One notable exception in this study was the concentration of IGF is same in both PL and AA-PRP. The study concluded that PL in particular affords an effective and efficacious therapeutic product given that the lysate may be obtained by mechanical activation rather than chemical activation. Conclusion: PRP appears to be a promising treatment to augment surgical procedures. The studies reported so far, though small, have documented the reduction in postoperative hair loss after HT. However, large studies are not available and no consensus is available on the desired platelet count, quantity, duration, interval between the sessions, and the mode of application. Further literature evidence for PRP should be expected with various research methodology, which will accumulate slowly over time. SDA was first suggested by Unger et al. in 1994 and this continues to be the global standard. They had described an SDA for over 80% of patients (under the age of 80 years). Such an area would consist of more or less a parallelogram in the parietal–occipital area, whose inferior border would be chosen by the surgeon on the basis of ≥10 hairs per 4-mm diameter circle [Figure 1]. This number would provide a “cushion,” allowing for a subsequent decrease in density with aging to eight hairs per 4-mm diameter circle. (The number of hairs per 4-mm diameter circle could be increased if one wanted to approach the donor area in an even more conservative fashion.) The superior border of the parallelogram would be 71.7mm superior to the inferior border. The anterior border of the parallelogram would similarly contain at least 10 hairs per 4-mm diameter circle and would angle somewhat anteriorly, parallel to the postauricular hair margin. A narrower more or less parallelogram would sit on the inferior one, with its posterior border beginning in the midparietal area. Its anterior border would be 28.6mm anterior to a line drawn vertically from the tragus and would be parallel to the temporal hairline, unless there were good reasons to suspect the area anterior to the tragus would not remain sufficiently dense over the long term. This superior parallelogram would be 12.3mm high (again subject to clinical findings and family history). Its superior border would drop somewhat inferiorly as it progressed posteriorly to meet the midline point of the safe occipital donor area. Lastly, in the midtemporal area, the “safe” donor area would extend 55.6mm superior to the superior parallelogram and then descend on a line drawn to meet the SDA in the midparietal area. It is important to point out that this design incorporates permanent hair whose long-term density would be eight hairs or more per 4-mm diameter circle, but that according to this criterion less dense permanent hair would persist superior and inferior to these boundaries in virtually all patients. Some of this less dense hair in some patients could be used as additional donor material if it were necessary. The aforementioned noted boundaries are not suggested as perfectly safe for all patients, but represent the implications of the only objective scientific evaluation of this area. On the basis of that investigation, they would be very safe in approximately 80% of patients under the age of 80 years. More restrictive areas can be chosen, for example, if one prefers to plan for patients who might live 80 or more years or if the patient has a father or maternal grandfather with Type VII male pattern baldness. Alt suggested that a line drawn perpendicularly from the external auditory canal should define the anterior border of the safe area [Figure 1]. In majority, the anterior border of this SDA was 6.5 to 7cm wide and steadily narrowed posteriorly. A horizontal line drawn from a point 2cm superior to the reflection of the skin of external ear and the scalp to the point where the line intersects the midline of occiput defines the superior border of SDA. Alt had also suggested that at least 2.5cm of unharvested permanent hair should remain superior to the most superior donor area to provide adequate long-term camouflage of donor scars. Cole suggested a definition of the donor area for FUE procedure based on his study on 64 Caucasians and 30 Asians. According to Cole, the total permanent donor area was 203cm2. He proposed a subdivision of donor area into 14 regions: 8 major regions (richer in follicles) and 6 minor regions [Figure 1]. The regions 1 and 5 measure 3.5×5cm, regions 2, 3, 4, 6, 7, and 8 measure 3.5×6cm, and the minor regions 9–14 measure 3.5×2cm. Bernstein and Rassman have suggested that the SDA consist of approximately 25% of the scalp and that only half of these donor area could be removed. They have suggested that a clear demarcation of the inferior border of the donor area is slightly controversial, as the inferior margin may move upward with the passage of time. Park et al. defined the SDA in relation to parietal whorl (PW) involving 1008 Korean adult males. They concluded that the progression range of vertex alopecia to the occipital side is the most critical factor in establishing the SDA. The objective and scientific prediction of the progression of vertex alopecia to the occipital side will allow the anticipation of the maximum progression range of vertex alopecia and the available SDA of each patient. According to this study, when the PW is anteriorly positioned, vertex alopecia initiates more anteriorly, and when the PW is positioned closer to the occipital side, vertex alopecia progresses posteriorly. Thus, the progression range of alopecia is verified to occur more extensively when the PW is positioned closer to the occipital side. Even though the PW may be anteriorly positioned, if the alopecia of the vertex area progressively spreads to the occipital side, the outcome becomes the same irrespective of the PW position. Hence according to Park et al., the location of the PW gives an idea to the extent of superior margin of SDA and the authors had suggested that alopecia mostly progresses within 6cm of the PW toward the occipital side among their study group and 97.5% of the study group had their occipital fringe 4.5cm below the PW. This area below the occipital fringe was considered as SDA [Figure 2]. It is worth emphasizing that there can never be one valid, totally SDA for all patients. A family history, assessment of the future progression of the androgenetic alopecia, and clinical examination would be necessary to confirm the boundaries of SDA. One should always err on the side of caution. There is a paucity of literature regarding the SDA in Asians and particularly Indian population. More studies are required for assessing whether the same findings reported from the studies of Caucasians are applicable to other race and ethnic groups. Should hairs be harvested from nonsafe area? : It has been argued of late by some hair transplant surgeons that hair from nonsafe area or less safe area can be harvested too, after appropriate consent from the patient that such hair may disappear in future, but patient will enjoy result for some time. These surgeons have likened this to the issue of other temporary results in treatments such as botulinum toxin, fillers, or surgery in vitiligo where relapse may occur. This approach is an offshoot of the development of FUE as the sole method of harvesting and the demand for larger sessions. As will be clear in the next discussion of FUT versus FUE, there is an ethical and mathematical upper limit for the number of grafts that can be harvested by FUE, of approximately 2500 in one session. Any requirement for more than this number can only be harvested either by accessing the nonsafe area in scalp or from a different part of the body. As body hair has its own limitations, it is tempting for the surgeon (or more likely the technician) to harvest from the scalp, particularly in a gullible patient who is desperate to have as many hairs as possible. In our opinion, this argument is untenable and only permanent hair should be used as a graft. It is entirely unethical to market HT as the only permanent method of hair restoration and then harvest from the nonsafe area, even if the patient consents for the same. The patient, already under stress of baldness, is gullible and easy to misguide. Harvesting nonsafe hair, leading to future loss from the grafted area, would bring the technique into disrepute and should be avoided in all situations. Summary: It is important that hair transplant surgeons understand the concept of SDA. The upper and lower limits for the donor should not be breached. Follicular unit extraction, now called excision (FUE), was advocated as an alternative to traditional strip harvesting of the donor tissue in view of the tendency for linear scar and greater postoperative pain in FUT. FUE has definitely contributed to the enhancement of donor area to other body parts and enhanced patient comfort. It has removed the fear of surgery and led to greater acceptance of HT among public. However, FUE has also led to “minimalization” or even trivialization of the surgery, leading to all and sundry claiming to be experts and to several ethical issues. A great deal of discussion by physicians and the general public has occurred on the Internet and multiple media sources about the value of FUE versus strip harvesting and vice versa. This article discusses the advantages and disadvantages of these two methods. Donor scar: is the scarring less in FUE? Strip harvesting produces a single linear scar. This is a significant concern for patients who wish to wear their hair very short. Although the thin linear scar is easily concealed by the hair above the scar, there are patients who have scars that have widened and there are also patients who have several scars from multiple procedures. Strip excision is a surgical technique that needs expertise and adherence to proper closure techniques. Of late, there has been influx of doctors of all specialties into this field, who may not have the necessary surgical skill. Patient’s healing tendencies vary and hence tendency to scar also varies. Aggressive harvesting to obtain large number of grafts, over 3000–3500 from strips over 2cm wide, leads to wide scars. Several techniques have been introduced to minimize the width of the strip scar such as limiting the width of the donor strip to less than 1.5cm, minimizing the tension while closing the wound, double-layered closure, undermining the edges, careful dissection along the line of incision to avoid damage to the follicles, including the previous strip scar and trichophytic closure, and insertion of few grafts into suture at the end of the surgery.,,,, Proper planning and execution greatly reduces the problems associated with scar formation in strip surgery. In spite of such meticulous procedure, some individuals end up with a bad scar. The primary rationale for the use of FUE is that a linear scar is avoided. FUE has been marketed as a technique that does not involve cutting and is therefore marketed as “nonsurgical” and “scarless”. Although a linear scar is not created with FUE, circular scars are created and hence it is not proper to use the terms scarless or no scar. The total area of excision is greater with FUE than with strip harvesting. This is apparent when one calculates the circumference of a 1-mm punch (1mm × π = 3.14mm) and then multiplies this by the number of grafts, for instance, 1000 grafts (1000×3.14 =3140mm, which equals 314cm). In comparison, in a strip harvest of 1000 grafts, assuming an average density of 80 FUs/cm2 and a 1-cm strip width, the length of the scar created would be 12.5–37.5cm (12.5cm per 1mm width of the scar, presuming the scar width ranges 1–3mm). Hence, the accumulated scarring area of FUE is greater than the area of linear scaring in FUT. If a patient becomes extensively bald (i.e., the donor fringe becomes very narrow), the line of FUT will generally still remain hidden, whereas the dots of FUE will be seen above (or below) the fringe of hair. With each subsequent session, the scarring in FUE is additive. For example, if the first FUE session is 2000 grafts, there will be 2000 tiny round scars. With a second session of 2000 grafts, there will be a total of 4000 scars. In contrast, with FUT, the first scar is completely removed in the next procedure. Even though the scar may be longer in the next session, with FUT, regardless of the number of procedures, the patient is left with only one scar. The scarring and distortion of the donor scalp from FUE make subsequent FUE sessions more difficult. Quality of grafts: does FUE yield less viable grafts? High-quality grafts are ones that are obtained from the most permanent part of the donor area, undamaged, and contain a protective layer of tissue around the follicles. The protective dermis reduces mechanical injury during insertion and from drying when the grafts are outside the body. FUT typically yields high-quality grafts, especially when clinical assistants are extensively trained in stereomicroscopic dissection. Some FUE grafts have very little tissue surrounding the follicles and are more prone to dehydration and damage because of manipulation during insertion of grafts, which might lead to reduced survival of the grafts in FUE. The lack of perifollicular tissue is often a result of “pulling” on the graft to remove it in FUE. No adequate studies are available to compare survival rates of grafts between FUT and FUE. In spite of the disadvantages in the FUE grafts, excellent results have been documented by FUE surgeons worldwide. Transection rates: is transection rate higher in FUE? One-off repeated aspect of FUE is that it leads to higher transection rate. FUE is a blind procedure in contrast to FUT. Strip, which is an open procedure with dissection, is performed under stereomicroscopic dissection. FUE involves releasing the hold of arrectores; however, the level of attachment of arrectores cannot be visualized. It is this fact, coupled with the pyramidal shape of the unit (with splaying of hairs at lower end) that results in transection. Partial transection decreases the total number of hairs in the graft and thus reduces the overall yield. Completely transected hairs do not grow. Hence, there is a need to reduce the transaction rate in FUE to as minimum as possible. In those individuals who had underwent mega sessions of FUE earlier, the transaction rate is greater in subsequent sessions because of angulation and scarring created during the previous surgery. However, it is also true that FUE techniques and instrumentation have improved over the years, transection rates have fallen from a high of around 10%–20% few years back to 2%–5% now. The time for extraction has also come down with better instrumentation, and it is now possible to complete a 3000-graft session in approximately 8h in 1 day. All these have resulted in increased popularity of the technique. Using optimal donor hair: which method yields greater number of grafts? Another difference between FUT and FUE is the proportion of FUs that can be harvested from the SDA. As discussed earlier, FUs at the outer edges of the donor area are more likely to be lost over time because of the progression of the balding process, but those from the midportion of the donor area tend to be more resistant to balding. However, in contrast to the above facts, there is one aspect where FUE is superior—FUE is the only method to extract body hair. This offsets the above limitation for the number of grafts from scalp. Technical expertise: is FUE easier? FUT needs greater surgical skill for proper closure and microscopic dissection. The surgical skill required to master FUE is different from FUT. In FUE, which is a blind procedure, surgeon should be able to align the punch to the angle of the follicles, presume the depth of the incision, and avoid transection. Patients with curly or very wavy hair may be difficult to treat when FUE is used. In comparison, strip harvesting is suitable for all types of hair. FUE can be a tedious process and both patient and physician may experience fatigue. This can limit the amount of grafts that can be harvested in a single session. The physician may need to use high power loupes 4×–6×. Working at a shorter focal distance can be tiresome and lead to neck problems. Specific features that promote FUE are lesser postoperative downtime, faster healing of the donor area, and rapid recovery, and there is no doubt that FUE leads to smoother postoperative period. Chances of hypertrophic scarring and keloids are rare in FUE. However, some complications, though minor, can occur in FUE such as burying of grafts, pinpoint white scars in donor area, and moth-eaten appearance in donor area because of over harvesting, epithelial cysts, donor site infection, and necrosis of donor area. In contrast, FUT is associated with significant postoperative pain, hypertrophic scars, folliculitis, cyst formation, and so on. Strip harvesting requires a larger staff, larger theater, stereomicroscopes, and larger space than FUE. For FUE, the surgeon can organize the surgery with just one or two assistants. For beginning surgeons, this is a major disadvantage as FUE also needs less stringent theater requirements. In FUT, technicians have to be taught how to dissect under microscope, which can be time-consuming. In contrast, there is hardly any dissection involved in FUE. Summary: Strip harvesting and FUE are both acceptable techniques for harvesting donor grafts. Each technique has advantages and disadvantages. 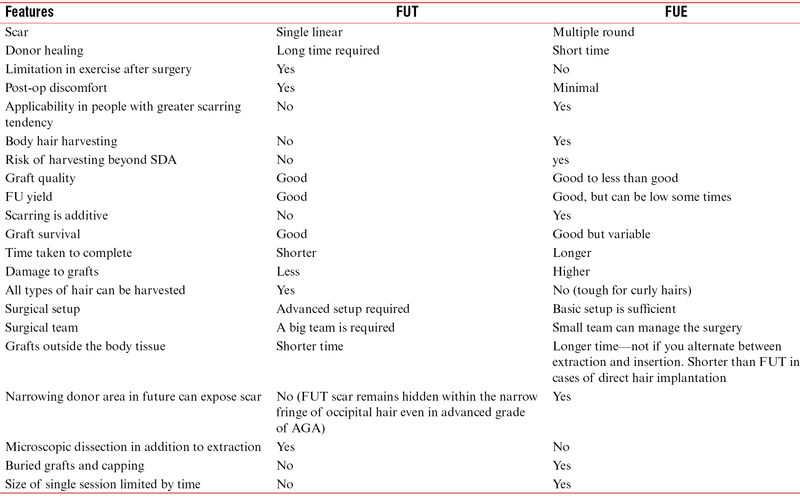 Combining FUT and FUE improves the graft outcome and the yield. FUT scores higher when multiple sessions of HT are required for a candidate and to have maximum optimization of the grafts from SDA. FUE is well suited for patients who insist on not having a linear scar. It may be an excellent choice for young patients seeking small procedures. FUE is the only choice for harvesting trunk, leg, and arm hair, and it is an excellent way to camouflage strip scars. However, the simplicity of the technique has also meant that unqualified people (technicians) have started performing this procedure independently, without supervision of surgeons. This aspect is discussed in the next section. Surgeons should learn all types of surgery and use the technique for each patient as per his requirements. [Table 1] summarizes the comparison of the two techniques. Who Can Perform Hair Transplant Surgery? As explained earlier, advent of FUE has led to minimalization or even trivialization of surgery, leading to aggressive marketing and entry of different types of doctors, dentists, alternative medicine doctors, and even technicians. This has raised significant legal issues in many countries, including the US. There are states where it is clearly illegal to have a nonphysician, nonphysician assistant, or nurse practitioner perform such surgery. The laws in other countries may present similar medicolegal problems regarding who can harvest tissue. For example, in Austria, Israel, Italy, Korea, Georgia, Thailand, Turkey, and Japan, only physicians are allowed to make incisions, and regulations vary as to the role of assistants in graft insertions. In some countries including the US, entrepreneurial nurses and medical assistants are setting up hair transplant clinics and hiring physicians as medical directors who may have limited or no hair transplant experience, but who “supervise” the procedure. Many US states allow the physician to delegate responsibilities to the staff under supervision, but both the degree of supervision and the extent of staff responsibilities are not clearly defined. To date, this issue has not been challenged or reviewed by any state medical board. In India, this issue has been raised, both in Medical Council of India and in consumer courts. There was an unfortunate case of death of a medical student after HT in Chennai, which was performed by a graduate physician. Another case in Hyderabad, resulted in necrotizing cellulitis after HT, which was also performed by an MBBS doctor. MCI has vacillated on this issue and has not dealt with clarity as to who can perform HT. In a reply under Right to Information (RTI) Act, MCI academic council skirted the issue and said the syllabus of plastic surgeons contains HT, without mentioning who can and who cannot perform. In another RTI reply, dental council stated that maxillofacial surgeons can take flaps from thighs and abdomen, but did not mention about HT in its reply. We are aware of two state medical council decisions, which stated that general practitioners with MBBS qualification cannot perform HT, but which subsequently have been questioned in courts. The position statement of the international society of hair restoration surgery (ISHRS) is that any procedure that involves tissue removal from the scalp or body, by any means, must be performed by a licensed physician in the field of medicine (adopted by the Board of Governors ISHRS, November 15, 2014). Physicians who perform hair restoration surgery must possess the education, training, and current competency in the field of hair restoration surgery. It is beyond the scope of practice for non-licensed personnel to perform surgery. Surgical removal of tissue by non-licensed medical personnel may be considered practicing medicine without a license by state, federal, or local governing boards of medicine. The society supports the scope of practice of medicine as defined by a physician’s state, country, or local legally governing board of medicine. In fact, it is for these reasons that ISHRS changed the nomenclature of “follicular extraction” to “follicular unit excision” and defined “follicular unit excision” as consisting of two procedures: incision and extraction. We believe that technicians should not perform any aspect of surgery independently; they should perform only under supervision of a physician and they are allowed to perform only those steps, which do not involve incision of the body. Hence, they should not perform scoring (incision), slit making, and suturing. They can be involved in picking up the grafts (extraction) after scoring, implantation into premade slits, arranging the grafts, and placing the postoperative dressings. Cervantes J, Perper M, Wong LL, Eber AE, Villasante Fricke AC, Wikramanayake TC, et al. Effectiveness of platelet-rich plasma for androgenetic alopecia: A review of the literature. Skin Appendage Disord 2018;4:1-11. Mahapatra S, Kumar D, Subramanian V, Chakrabarti SK, Deb KD. Study on the efficacy of platelet-rich fibrin matrix in hair follicular unit transplantation in androgenetic alopecia patients. J Clin Aesthet Dermatol 2016;9:29-35. Navarro RM, Pino A, Martinez-Andres A, Molina C, Martinez AM, Martinez N, et al. The effect of plasma rich in growth factors combined with follicular unit extraction surgery for the treatment of hair loss: a pilot study. J Cosmet Dermatol 2017;26:1-12. Cole JP, Cole MA, Insalaco C, Cervelli V, Gentile P. Alopecia and platelet-derived therapies. Stem Cell Investig 2017;4:88. Uebel CO, da Silva JB, Cantarelli D, Martins P. The role of platelet plasma growth factors in male pattern baldness surgery. Plast Reconstr Surg 2006;118:1458-66; discussion 1467. Garg S. Outcome of intra-operative injected platelet-rich plasma therapy during follicular unit extraction hair transplant: a prospective randomised study in forty patients. J Cutan Aesthet Surg 2016;9:157-64. Unger R. Platelet rich plasma (PRP) and its use in hair restoration. Hair Transplant Forum 2017;27:45-7. Perez-Meza D. Wound healing and revascularization of the hair transplant graft: the role of growth factors. Hair Transpl 1995;1:287. Rinaldi F, Sorbellini E, Coscera T. The role of platelet rich plasma to control anagen phase: evaluation in vitro and in vivo hair transplant and hair treatment. Int J Trichology 2011;3:514-5. Akiyama M, Smith LT, Holbrook KA. Growth factor and growth factor receptor localization in the hair follicle bulge and associated tissue in human fetus. J Invest Dermatol 1996;106:391-6. Yepuri V, Mysore V. Effects of hormones on hair. In: Mysore V, editor. Hair Transplantation. 1st ed. New Delhi, India: Jaypee; 2016. pp. 21-3. 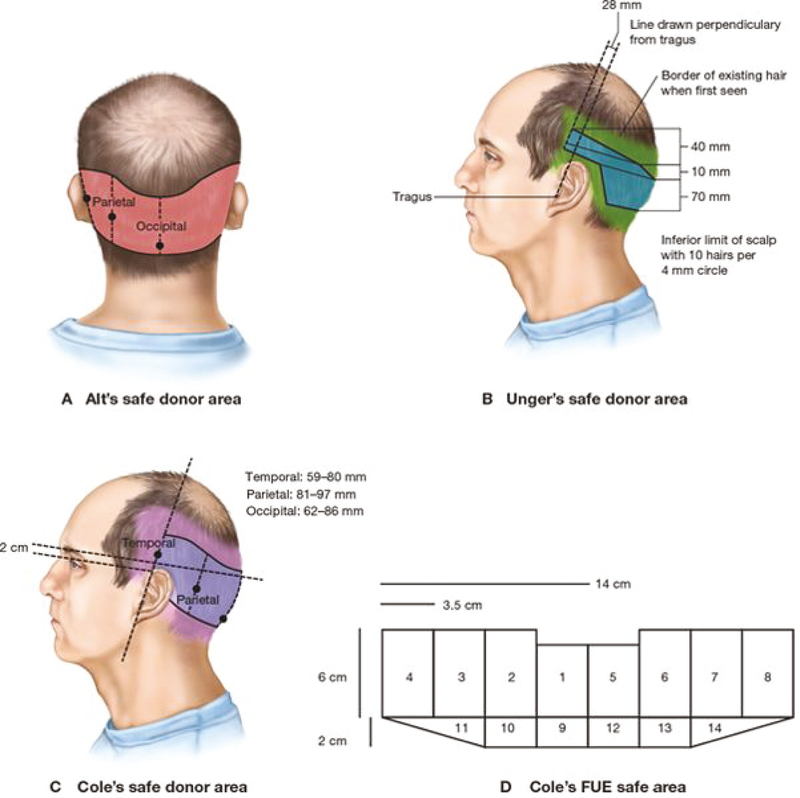 Unger W, Solish N, Giguere D. Delineating the “Safe” donor area for hair transplanting. Am J Cosmet Surg 1994;11:239-43. Devroye J. An overview of the donor area: basic principles. In: Unger WP, Shapiro R, Unger R, Unger M, editors. Hair Transplantation. 5th ed. New York: Informa Health Care; 2011. pp. 247-62. Bernstein RM, Rassman WR. Follicular transplantation. Patient evaluation and surgical planning. Dermatol Surg 1997;23:771-84; discussion 801-5. Park JH, Na YC, Moh JS, Lee SY, You SH. Predicting the permanent safe donor area for hair transplantation in Koreans with male pattern baldness according to the position of the parietal whorl. Arch Plast Surg 2014;41:277-84. Khanna M, Purohit V. Donor strip techniques. In: Mysore V, editor. Hair Transplantation. 1st ed. New Delhi, India: Jaypee; 2016. pp. 172-7. Garg AK, Garg S. Donor strip harvesting surgical methods. In: Mysore V, editor. Hair Transplantation. 1st ed. New Delhi, India: Jaypee; 2016. pp. 164-71. Sattur S. Trichophytic closure. In: Mysore V, editor. Hair Transplantation. 1st ed. New Delhi, India: Jaypee; 2016. pp. 178-81. Garg AK, Garg S. Donor area complications of strip harvesting. In: Mysore V, editor. Hair Transplantation. 1st ed. New Delhi, India: Jaypee; 2016. pp. 282-7. Dua K, Dua A, Chahar M. Repeat hair transplant. In: Mysore V, editor. Hair Transplantation. 1st ed. New Delhi, India: Jaypee; 2016. pp. 293-304. Bernstein RM. Commentary on association between scalp laxity, elasticity, and glidability and donor strip scar width in hair transplantation and a new elasticity measuring method. Dermatol Surg 2017;43:582. Mahadevia B. Comparison of follicular unit transplantation and follicular unit extraction: a critique. In: Mysore V, editor. Hair Transplantation. 1st ed. New Delhi, India: Jaypee; 2016. pp. 199-204. Dua K, Dua A, Chahar M. Dos and dont’s of FUE. In: Mysore V, editor. Hair Transplantation. 1st ed. New Delhi, India: Jaypee; 2016. pp. 205-12. Saxena K. Follicular unit extraction: technique and instrumentation. In: Mysore V, editor. Hair Transplantation. 1st ed. New Delhi, India: Jaypee; 2016. pp. 190-8. Dua K, Dua A, Chahar M. Complications of FUE. In: Mysore V, editor. Hair Transplantation. 1st ed. New Delhi, India: Jaypee; 2016. pp. 288-92. Mysore V, Omprakash HM. Setting up a hair transplant unit. In: Mysore V, editor. Hair Transplantation. 1st ed. New Delhi, India: Jaypee; 2016. pp. 378-89.
International Society of Hair Restoration Surgery. [Internet]. Available from: http://www.ishrs.org/. [Last accessed on 2018 Aug 02]. Association of Hair Restoration Surgeons of India. [Internet]. Available from: http://www.ahrsindia.org/. [Last accessed on 2018 Aug 02].